The men are working hard moving wet cement by five gallon buckets to the roof. They have been at it for almost two and a half hours without a break and are two thirds done. They work fast and hard all by hand except for the small cement mixer. Then it all has to be smoothed and leveled by hand too. The forms are in place and I have been told that tomorrow morning the pouring of the cement will begin. There will be extra men on hand to handle the cement. The only machine involved is the small cement mixer and the cement will be moved by hand to the top of the forms and poured into them one bucket at a time till the forms are filled. Quite an undertaking and lots of heavy work. The photos below are of the forms that make up the roof and bond beam that includes the porch posts. It has taken a lot of work to get to this point hopefully everything will go well. The work on the roof has begun the cross beams are in place as are most of the 6″ slabs of foam insulation. Later this week (maybe) the cement will be poured forming the roof. The roof will have lots of rebar and other metal to give it strength. Allegedly we can have a party up there if we wanted to. This is Carnival time in Mexico and the workers are distracted as they have parties and kids in the parades and this is the last week to drink as most of the men give up alcohol for lent. At least that is their story. By the time Easter week comes they are thirsty and nothing gets done then. The local parades are interesting as every little kid in town must be in a dance group and parading with music provided by portable disco equipment on trucks decorated for the occasion. Seems like the kids are having a good time. I have had three sessions with my Spanish tutor and I have a lot to learn or re-learn and I have homework too 🙂 Hopefully I will learn enough to get out of the beginner mode and on to a more functional level of Spanish. I can hope,,, right? Just click on the first photo and it will take you to a slide show you can control by putting your cursor on the right side of the photo and right clicking or using your right arrow key to move from photo to photo. I think in a week we will be putting in forms for the roof. So far this past week the building has been going well the walls are up to 8′ now and the electrical wire has ben pulled to the outlet boxes in most of the house. Maybe by the end of this week or the beginning of next week the forms will be set for the roof. So things are going well. I got internet on tuesday; I used it wednesday and part of thursday and then it quit working. I have phone service but no internet-the telephone company said they would send someone out to check on it for me but who knows when that will happen. So, it is back to using the internet at the restaurant until the internet service at my RV works again. I went to three interesting things this weekend the first was the swap meet where I bought a blouse and some fresh vegetables and a hardware store where I got a water hose for the RV repaired and found that they have a very interesting inventory of there. I bought a shovel and a fly trap, so far the fly trap hasn’t caught one damn fly 😦 maybe later after the bait stinks enough it will catch a fly or two….maybe. I have employed a young lady to help me with my spanish speaking ability she seems to take her work seriously. We had our first meeting yesterday and today will be our second meeting. I have home work; I have to tell her what I did today in spanish using the past tense. This ought to be interesting ! I’ll post some photos later as I forgot to bring the wire to connect the camera with the computer to the restaurant with me. The walls keep going up and the details such as electrical outlets and telephone/TV outlets are in as well as the openings for the windows. Now that the walls are higher I can get a feel for the way the house will feel when completed and the house plan seems to be a good one. The telephone man showed up today and within minutes I had telephone and internet service. The hook-up is only temporary as when the house is finished I’ll have the telephone and internet line moved to the casita. So far the internet has been very good much to my pleasure no more frustrating waits and getting dropped from the connection and I don’t have to go anywhere for connection to the internet. I haven’t used the telephone yet as I don’t have a phone, I will buy one soon as I find one I like. Now I have most of the services of a residence; electricity, water, sewer, satellite TV, Telephone and internet. The only thing missing is mail delivery and that just doesn’t happen here. Cloudy and cool day today the workers were working hard all day. I think that there is one more row of blocks up for the casita and the beginnings of the pillars for the arches on the porch, more pipes and some of the electrical outlets have been cut into the blocks and a lot of cement has been poured into the voids of the blocks where rebar was sticking through. At this point, there are four rows of blocks and horizontal rebar has been added to give more strength to the structure laterally. It is rumored that the roof pour may be at the end of next week or the beginning of the following week ! It appears that the work is progressing well. Some of my RV friends are surprised at the speed of the construction. I think I got lucky and found a builder who didn’t have any other projects going and workers who are productive. It has begun to rain tonight, I hear it on the roof of the RV-for a place that is is so dry we sure have had our showers this winter ! The saying here is “it doesn’t rain here” I think it must be a inside joke because since I have been here it has rained five or six times not a lot but it does get the ground wet at least for a while. 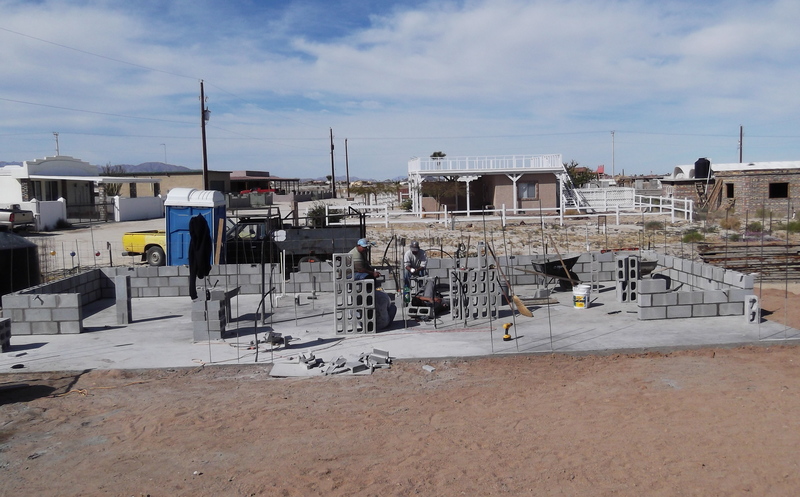 Here are some photos of the start of building the walls to the little house here in San Felipe. The above photos show the new pad for the casita curing over the weekend. Monday, if all goes well, the first blocks will be laid to start the walls. I went to the swap meet this morning and bought a sink for the bathroom, a big colorful pot and a toaster. Toaster caught fire the first time I used it so I threw it out the door and then when it cooled off into the trash! The toaster cost only $3.00 so no great loss. I also purchased some garden soil for future plantings. The soil here if you want to call it soil is mostly sand with some salt residue. Most plants struggle to live in it except for some nasty things with sharp burrs that make life difficult if your a pet or wearing thin soled foot wear-don’t even think of going bare foot. Most people have dirt brought in and to build up the level of the soil for drainage reasons and have their yards covered either with gravel or with pavers to increase the comfort of all walkers no matter how many feet they have. I already have some cuttings from a neighbor’s yard to start planting with and later will add to that from the plant nursery in town. Today the cement was laid for the footings and pad for the casita. This was after a lot of rebar and other metal was put into place and tied together. Then this morning extra men showed up for work and once the gravel was delivered the cement mixer was started and about four and half hours later all that was left for the day was smoothing and leveling the cement. Here are some photos of the the work in progress. Mixing the cement and moving it by wheel barrow ! I’ll post the photos of the poured pad later. The cement blocks are starting to arrive and the laying of the block may begin monday!